New TCG Set! Blue Impact and Red Flash! XY Break! Details for the next Japanese TCG ser and block has been revealed! 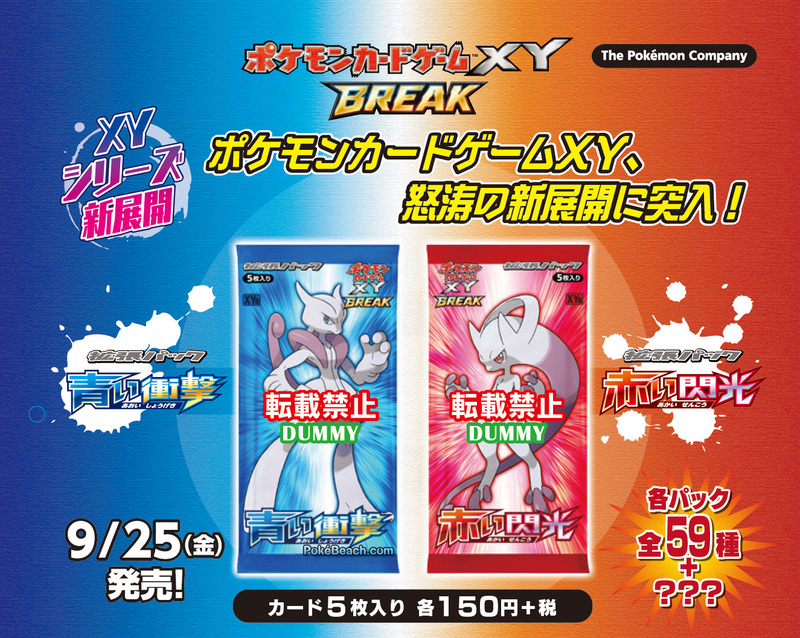 The new block will be called XY Break and the first sets for it will be called Red Flash and Blue Impact. These two sets will included Mega Mewtwo X and Mega Mewtwo Y. It has been awhile since we have had split sets in the Pokemon TCG. The last time we have had split in Japan was for XY. Because of this, that means the feature Pokemon will be split between the two sets. Blue Impact will feature Mega Mewtwo X and Red Flash will have Mega Mewtwo Y. If you are following the rotation speculation rumors then I believe we have another piece of evidence that will suggest an XY-on formation for the 2015-2016 season. After all, we can’t have two different Mewtwo EX in the format where one is clearly better then the other. During this reveal, we have also gotten the name of the block which will be called XY: Break. This is interesting because last week there was hint in the form of “Break Evolution”. There was no details as what this means but most likely Break Evolution could be a new mechanic. The word “Break” seems to have gotten popular in the TCG recently as it is being used in part of the block name, the name of the Japanese set for Roaring Skies (which was Emerald Break) and now for a mechanic. If Roaring Skies/Emerald Break is any indication of what to expect for Break Evolution then it looks as if we are going to have a faster way to evolve our Pokemon. We may see more of this Break Evolution mechanic in Japan via two 12-card packs called “Break Evolution Pack: Raichu Break” and “Break Evolution Pack: Noivern Break”. It looks like they will be featuring the new mechanic based on the description, “Feel the Break Evolution”. Lastly, there will be a new deck box which is always release with a new set. This product will feature a deck box, 45 Energies with a new design, and 5 special cards. It will be interesting to see what these special cards will be as they may be included in the English release of the set. Red Flash and Blue Impact will be release in Japan on September 25th. ← Special URPG Times: Roleplayer of the Month & Pokemon of the Month!